There were 8 individuals arrested within the last 24 hours including 6 men and 2 women, between 16 and 69 years of age, for the following: assault, care and control of a vehicle while impaired by alcohol, over 80 mg of alcohol care and control, utter threats, possession of a controlled substance, obstruct police, breach peace, breach undertaking, and three counts of breach probation. On July 30, 2018 the accused and victim were in their west end residence. The accused was allegedly drinking and became verbally abusive with the victim over what she was making for dinner. At approximately 9:30 p.m. the accused went into the bedroom where the victim was laying down and physically kicked her out of the bed. When the victim called police the accused attempted to leave in a vehicle, but while reversing he ran into the ditch on the opposite side of the roadway. Responding officers located the accused hiding and passed out in a garden shed at the rear of the residence. Unable to wake the accused, Frontenac Paramedics were called and the accused was transported to hospital. Once the accused became conscious and was medically cleared, he was arrested and transported to police headquarters where he provided two breath samples. The accused was found to have just under 1 ½ times the legal limit of alcohol in his system. A 69-year-old local man is charged with assault, care and control of a vehicle while impaired by alcohol, and over 80 mg of alcohol care and control. The accused was later released with a future court date. His driver’s licence is automatically suspended for 90 days and would face a one year suspension if convicted. Overnight from July 6-7, 2018 a wallet was stolen from a vehicle parked in the west end. Two of the credit cards and the debit card were then used to make multiple transactions. Please view the attached photo of the suspect. Anyone with information, is asked to contact Constable Dan Silver at 613-549-4660 ext. 6243 or via email at dsilver@kingstonpolice.ca. Kingston Police receive complaints on a regular basis in regards to wallets, purses, and valuables stolen from motor vehicles. Police recommend that you lock your vehicle whenever it is unattended, even for quick stops. Regardless of whether you choose to lock your vehicle or not, please do not leave valuables inside. Cancelling credit/debit cards, dealing with potential identify fraud, and going through the process of obtaining new financial cards and identification is not only a significant inconvenience, it can also be a costly mistake. Kingston Police have received multiple complaints of a parking lot scam currently targeting local residents. The scam involves a male and female or lone male approaching a victim walking to his/her vehicle. The suspect produces a bill (usually $20), claiming to have found it near the victim’s vehicle and asks if it belongs to them. Once the victim pulls out a wallet or purse to check, the suspect steals their bank card, leaves and immediately makes withdrawals. Often the victim does not realize their card has been stolen at that time, as the suspect uses distraction techniques such as “accidently” bumping the victims’ wallet out of their hand. On one occasion the suspect outright grabbed the victim’s wallet and stole the card. An accomplice inside the store may be obtaining the PIN by getting in line behind the victim. Loses are typically around $1000, however one victim reported a theft of $4500. Three of these thefts occurred in the Walmart parking lot located at 1130 Midland Avenue, however it is suspected other areas may be targeted. 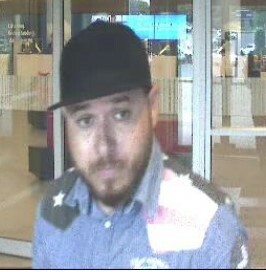 The photo below from is from a bank where one of the stolen debit cards was used. 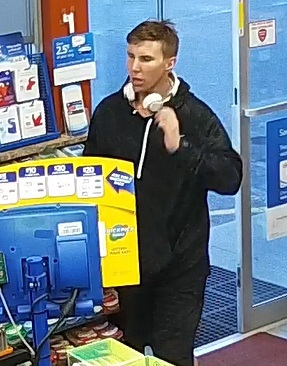 The male in the photo is a suspect for use of the stolen card, it is unknown at this time if he was involved in the actual theft. Anyone with information, is asked to please contact Detective Brad Hughes at 613-549-4660 ext. 6286 or via email at bhughes@kingstonpolice.ca. Please share this information with family and friends to help prevent further victimization. Remember to conceal your PIN while entering the number and do not keep your PIN number written down with or near your bank card. Be sure to use caution and keep your distance if you are suddenly approached by strangers in parking lot.